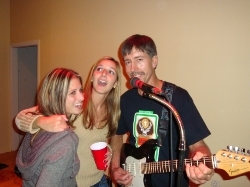 After these two fine women helped Frank sing "Wonderful Tonight" during FPB's evening gig of October 11, 2008, Fritz offered up some words of praise. Frank gets some help with the lyrics to "Wonderful Tonight," toward the end of FPB's evening gig for the Oktoberfest at the Mountain View Resort in Glen Spey, NY on October 11th. Fritz and Frank present some Jagermeister stretchy shirts to some new FPB fans, as Rick and Tom witness, during FPB's evening gig of October 11th in Glen Spey, NY. 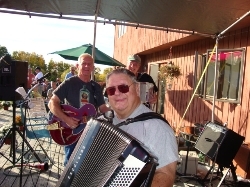 Tom and Fred are pictured here near the end of FPB's gig at the Tri Valley Ski Club Oktoberfest in Chittenango, NY during the afternoon of October 11th, as special guest, Bruce Gerow plays accordion. 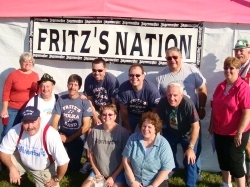 The guys in Fritz's Polka Band pose with some great friends (members of Fritz's Nation) during the afternoon of October 11th at the Tri Valley Ski Club Oktoberfest. 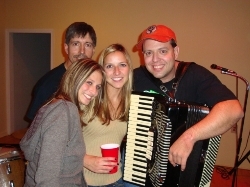 As Frank looks away in the background, Rick puckers up to Helga, and FPB Fan Club Member, Dave Halsey stands by during the afternoon of October 11, 2008 in Chittenango, NY. 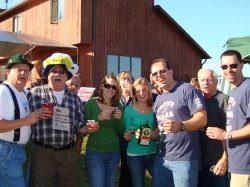 Fritz, Tom, and Rick tip some Jagermeister punch with their friends at the Tri Valley Ski Club Oktoberfest during the afternoon of October 11, 2008. 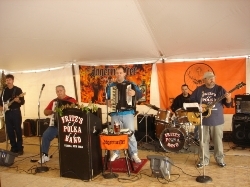 Fritz's Polka Band rips through a tune during their afternoon gig of October 11, 2008 in Chittenango, NY at the Tri Valley Ski Club Oktoberfest. 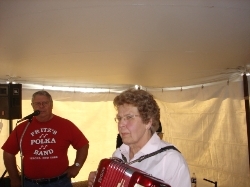 Fred yodels as Special Guest (and FPB Fan Club Member), Betty Miller jams with FPB during FPB's second set at the Franklin Hotel Oktoberfest on October 5th. 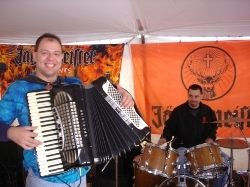 Fritz and Rick are shown here as they rip through a tune during FPB's gig at the Franklin Hotel Oktoberfest on October 5, 2008. 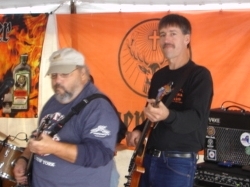 Gabe and Frank are pictured here during FPB's second set of October 5th in Rome, NY. Don't worry....those aren't antlers coming out of Rick's ears. 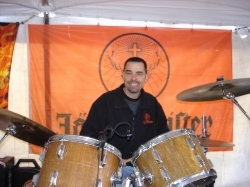 Rather, it's the Jagermeister flag hanging behind him on October 5th at the Franklin Hotel Oktoberfest. The guys in FPB are pictured here with Chris and her Mom, Ann, on October 5th in Rome, NY. 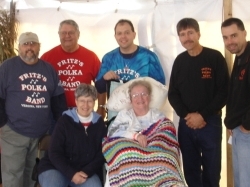 Ann had been badly injured in an accident and hadn't seen FPB perform in over three years. Ann's appearance made the day for FPB! 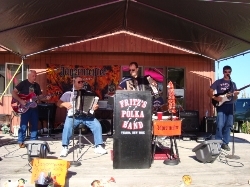 Frank, Fred, Fritz, Rick, and Gabe are shown here during FPB's first set of October 5th during the Oktoberfest at the Franklin Hotel. 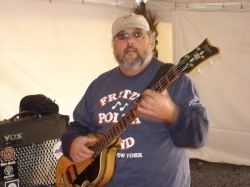 Gabe is pictured here with his Hofner on October 5, 2008 during the Oktoberfest at Franklin Hotel in Rome, NY.